On March 5, 2018, the Experts for Security and Global Affairs Association (ESGA), Bucharest, Romania, hosted a debate with two invited guest experts from Poland: Dr Piotr Oleksy, Adam Mickiewicz University, Institute of European Culture and Kamil Calus, the Centre for Eastern Studies (OSW), Poland. The event was dedicated to the political dynamics and regional security in Eastern Europe. The debate was held in Bucharest, with the aim to bring together in an open dialogue experts from Poland, Romania and Republic of Moldova in an effort to analyze the Polish and Romania’s projection of foreign policy decisions regarding Eastern Neighborhood and challenges faced by the different political and social actors from these three countries during 2017. Thus, Romanian experts had the opportunity to discuss a number of issues related to Polish and Romanian foreign policy, Eastern Partnership, EU’s security on the eastern flank, Russian propaganda and political influences of Kremlin in the region and also theThree Seas Initiative. 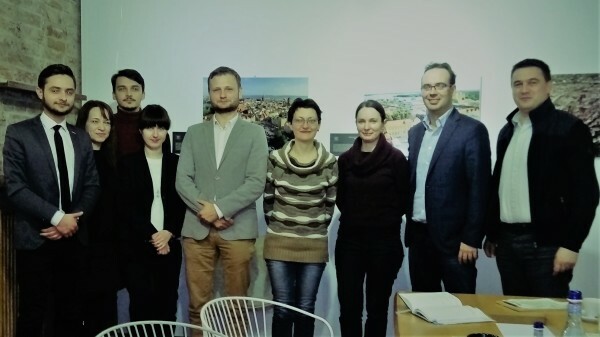 During the debate, Dr Piotr Oleksy presented to the Romanian experts on the topic of “Identity dynamics in the Republic of Moldova and Transnistria in the context of international relations in South-East Europe”. Most of the discussions were focused on the foreign policy interest projections of Poland and Romania in the Republic of Moldova, and the key question in this context is the following: was Moldova a success story of the Eastern Partnership and if so, then what resources does it have to return to the top of the list and how can processes in Transnistria influence the Chisinau’s European path? Among the specific questions that the experts tried to find answers to are the following: how do countries such as Ukraine or Moldova matter in the foreign policies of Romania and Poland? How do we organize foreign policy interests in increasingly unstable domestic conditions? How consistent is the strategic partnership between Poland and Romania and what are the perceptions of the decision-makers about its importance to both states? In the absence of such kind of dialogue, the debate had the goal to identify and explore the future issues for cooperation among experts, understanding and taking into account the genuine interests and priorities of the parties. As the format was of high interest for the numerous experts from different Romanian think tanks that attended the debate, the decision to organize such events in the future was taken. A series of meetings between polish experts and ESGA will follow both in Bucharest and Warsaw. This is a debate organised within the project “Understanding the Eastern Neighborhood. A unique platform for comprehensive debates and analysis on Russian affairs”, implemented by ESGA between February 2018 – January 2019.